As tariffs and trade wars engulf business headlines, American auto companies continue to manufacture the majority of their cars in the USA, according to the 2018 Kogod Made in America Auto Index. General Motors snatched the top two slots on this year’s index with the Chevrolet Corvette and Volt models, respectively. 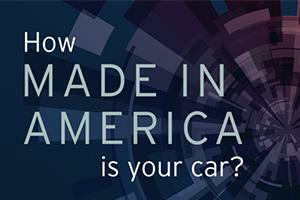 The Kogod Made in America Auto Index was created in 2013 by Kogod School of Business Associate Professor Frank DuBois. The index ranks more than 500 vehicles and draws on data provided by the American Automotive Labeling Act and on-site dealership visits to calculate the estimated domestic content of the most popular vehicles on America’s roads. DuBois’ index also draws on additional criteria to develop its rankings to provide a clearer picture of the economic impact of the vehicles in the index, including: profit margin, labor content, major component sourcing and major location of research and development activities. Ford Motor Company had a strong showing in the top-10, occupying five slots with two models of the Ford F-150 (third and fourth), the Lincoln Continental (fifth), the Ford Taurus (ninth) and the Lincoln MKC (tenth). Three of Fiat Chrysler’s Jeep Wrangler models occupy spots six, seven and eight. Honda’s Ridgeline (6), Odessey (6) and Pilot (10) were also in the top-10. For consumers who value purchasing an American-made car, the Kogod Made in America Auto Index provides the most comprehensive listing of cars available. While some vehicles come close to being all-American, DuBois acknowledges that globalization has all but eliminated the idea of a truly American-made car. Looming over this year’s index are the threats of tariffs and trade wars that will have a big impact on the auto industry if enacted. DuBois predicts future price increases for automobiles as a result. The 2018 Kogod Made in America Auto Index is available here.